I was too young to be really aware of The Strokes burst onto the scene in 2001, but when I did get into music it was impossible not to be aware that they were *the* band - the coolest, the most adored, the most influential, their sound being recycled by countless pretenders to the throne throughout the first decade of the 21st century. Effortlessly brilliant, the sunglasses adorning their face seemed to hide some intangible magic. Their sound, whilst obviously bearing much debt to countless garage rock predecessors, was nevertheless vibrant and alive, and their swaggering arrogance was more than forgivable. Which is all very well and good, but of course this is a review of their latest offering. But still, such was the impact of 'Is This It', and to a lesser extent the two follow ups to that, that what comes after will, for better or for worse, be heard amidst the reverberations of that previous achievement. The fact that The Strokes’ sound has been mined to within an inch of its life by other, perhaps lesser bands, in the intervening years, means that there is a conundrum - they are no longer the hip young things, and their sound is no longer new or exciting, and now that the energy and excitement levels have dipped, their trademark aloofness, in abundance on 'Angles', comes across as boring, or worse, an unimaginative pastiche of their once-great selves. I mean, The Strokes have always had a decent ear for a melody, and this is no departure from that - it’s quite good, with 'Taken For A Fool', and 'You’re So Right', perhaps coming closest to rekindling their heyday, whilst not quite escaping a malaise affecting almost of the album, in being fairly inventive at times but in a meandering, stop-start sort of way. They seem to be caught in some sort of paradox, keen to show that they are trying to inject a bit of inventiveness even within the framework of a Strokes ‘sound,’ but at the same time unable to commit properly, almost ashamed of trying too hard, with Julian Casablancas’ lackadaisical vocals belying the fact he recorded them separately and sent them over electronically. Seemingly struggling for inspiration, or perhaps just desire, he laments "living in a empty world", on 'Games', which is not too much of a departure from the often-melancholic themes of previous lyrics, but without much life from the rest of the band, it all just sounds a bit pedestrian. 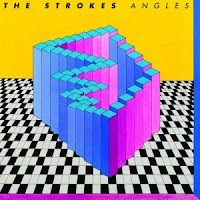 Perhaps it is the fact that it is The Strokes which makes 'Angles' seem a bit worse, perhaps without all the baggage behind it, it would be a bit more palatable, but that’s irrelevant, it is by The Strokes, and despite some peaks such as 'Metabolism' and 'Two Kinds Of Happiness', the record is on the whole slightly disappointing – after 5 years of build up it just seems a shame they couldn’t have injected a little bit more verve and vigour to proceedings. Stream the album in full here. Purchase at Amazon.co.uk, iTunes etc.